Spring ball park clean up events are April 27 and May 4. Click on VOLUNTEER for further details. Extra hands always needed. Our SPRING play schedule is now available as a downloadable PDF. Click on “PLAYERS” above to access. And registration is also available NOW for both players and coaches/assistant coaches. Kiwanis ML Opening Day 2018 from Brian Keairns on Vimeo. Player & Coach Registration available ONLINE! OCTOBER 28: We’re fully winterized and closed down for the year. See you in 2019! OCTOBER 20: Our last 2018 special event–the Mercy Loop ONE MILE FUN WALK/RUN. Thanks to the Des Moines Marathon, proceeds benefit the Kiwanis Miracle League. OCTOBER 13: Over 400 enjoyed our year-end TROPHY/PIZZA Party! Thanks to Lutheran Church of Hope for again hosting us. Pizza and “all the trimmings”, celebration of our 2018 spring and fall seasons, our new playing surface, and, of course, TROPHIES! Contact your coach if you were unable to attend and want your 2018 trophy. OCTOBER 6: Our last Saturday of fall play–and Mother Nature is very unfriendly. But we are playing! Come on down! It’s not raining, but very cold for this time of year. Bring jackets, even blankets for those sitting in the stands. Hot cocoa is a big seller at the concession windows. SORRY, BUT WE ARE CANCELLING THE 4 PM GAME–It’s misty, raining here and still very chilly. Just not a nice day. OCTOBER 1: Tonight was supposed to be our annual event with the Des Moines Police & Fire Departments as our buddies, always a special evening. Unfortunately, due to this awful weather, we are CANCELLING–so no games tonight. SEPTEMBER 29 NEWS FLASH: We’re CANCELLING the rest of today’s games. Starting to rain here and heavy on the west side. SEPTEMBER 29: Yes, we’re playing today–it’s a bit chilly, but it’s not raining. AND it’s time for our PARTY–A BIRTHDAY PARTY. Join us for festivities all day long as we celebrate TEN YEARS of the Kiwanis Miracle League. Balloons, banners, and, of course, birthday cup cakes for all! SEPTEMBER 22: Join us for a fun-filled day of KML baseball. Games all day long! SEPTEMBER 18: Our annual Des Moines Police & Fire Department Night is POSTPONED due to weather. Plan on Monday, October 1–two games at 6 & 7 PM. SEPTEMBER 13: We hosted Ankeny Miracle League players for two ALL STAR Games. The SE Polk Girls Softball team and SE Polk HS Best Buddies Chapter were our buddies. Thanks to PapaJohn’s who donated some of the pizzas so we could provide free pizza for players and buddies. Was a fun evening! SEPTEMBER 8: Should be a great day for KML baseball—-may be even a bit cool this morning. Royals vs Mets at 9 AM. But it’s also the day of our great state football rivalry. ISU vs Iowa at Kinnick Stadium in Iowa City at 4 PM. Wear your favorite school colors. And don’t forget to signup for September 13th & 18th special events! SEPTEMBER 1: We cancelled our 9 & 10 AM Games due to rain. Rest of day was a great Saturday of play! AUGUST 25: Opening Day of Fall Season finally arrived! It was a hot one–but ALL who attended had a great time. All players and coaches must be registered. It’s easy–right here on our web site. Play schedule is posted here as well, along with fall special events that you won’t want to miss! AUGUST 10: Thanks to ALL who attended/played/coached at our special night of “All Star” Games during the NE-IA District Kiwanis WORLD SERIES Convention. We had an abundant number of players and coaches for both games. The Hy-Vee griller prepared some awesome sandwiches and the Kona Ice truck was a special treat. NE-IA Key Club board members served as buddies. Our guests experienced the Kiwanis “miracle” in our very special ball park. JULY 21: The day was a beautiful end to our spring/summer season. We opened with the White Sox vs the Twins and are wrapping up with the Tigers vs Pirates. Fall Season begins August 25. Click on the registration buttons at right to register soon. JULY 14: Thanks to the Journey of Hope cyclists for being our buddies at the 3 and 4 PM games. What fun to see ALL those blue shirts on the field assisting our players! And it was our annual DAIRY QUEEN Day! Thanks to the Polk County Dairy Queen Association for providing us with these special treats! JULY 7: The weather is perfect for baseball. It was the Phillies vs the A’s at 9 AM–a great group of buddy volunteers from Buena Vista University and several individuals. And the Pirates and the Tigers (adults) are wrapping up the day with “Iowans for Nebraska” as buddies. Looks like the score will be 20 to 20! Individual and team pictures are complete–it’s been a full day of fun! We also will be recognizing and remembering our friend, assistant coach (A’s), and announcer LARRY COTLAR. Larry’s very unexpected death in last weekend’s flash floods has stunned us all. We will remember him with a moment of silence before each game and place an engraved paver in our Kiwanis Memory Garden in the near future. Our thoughts and prayers are with his wife, Deb, and the entire Cotlar family. Watch here for any weather-related announcements. (Messages also posted on Facebook and on our voicemail at 515.280.5017). ALERT…(6/25/18 4:30 PM) We are sad to announce that due to weather conditions, tonight’s exhibition games vs. the Ankeny Miracle League in Ankeny have been cancelled due to weather conditions. Make-up games TBD. 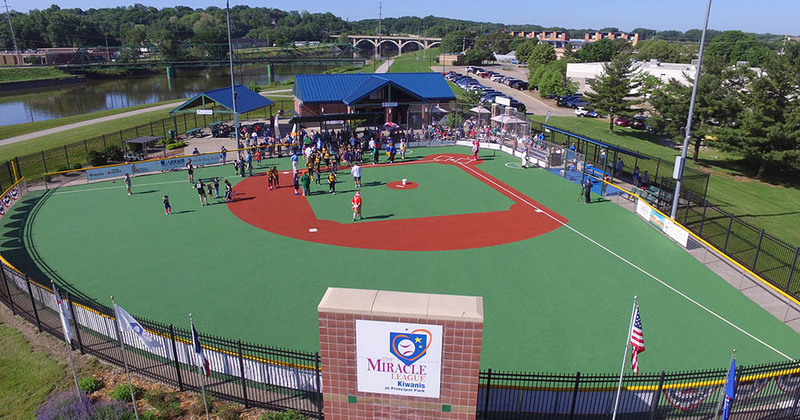 JUNE 25: We are “traveling” to Ankeny to play 2 games, 6 & 7 PM, with the Ankeny Miracle League players. Fun! JUNE 23: NO GAMES!! All June 23rd games will be played on July 21. June 16: CANCELLED OUR NOON, 1, 2, 3, and 4 PM games due to heat. June 12–Our two “All Star” games featured The Iowa Barnstormers as our buddies! Great food! Great crowds! Great fun! June 9: No rain, so we got all 8 games in! But it was a warm one! May 26: It was more than warm. It was very HOT! WE CANCELLED THE 1:30, 2:30, 3:30 & 4:30 games. If this happens again, and you’re scheduled for the afternoon games, please come for any of the morning games! May 26: Opening ceremonies are over–not sure if the Shrine clowns won or the SE Polk Girls Softball team “won” in our exhibition game. Thanks to Polk County Supervisor Mauro for saying a few words and cutting the ribbon to make the new playing surface officially opened. We’re getting a brand new playing field this spring. Our much anticipated field update is complete and ready for play! OPENING DAY is MAY 26th with Opening ceremonies at 9 AM. Ribbon cutting featuring John Mauro, Polk County Board of Supervisors, announcing the significant contribution the County has made to our Kiwanis Miracle League. Buddies will be Girls Softball Team from SE Polk HS. Cubby Bear and Shrine clowns, lots of fun! Plan to join us! May 19: Thanks to the Des Moines Police Department for making Kiwanis Miracle League one of two beneficiaries of the Annual 5K “Run with the Police”. More info at RUNWITHDMPD.COM. Proceeds will benefit our field replacement! Kiwanis Signature Project Gold Winner: Kiwanis Club of Des Moines from Kiwanis International on Vimeo. Kiwanis Miracle League is truly a miracle as it provides a place for children with special needs to enjoy our nation’s pastime, Baseball. But it is truly so much more than that. It is an opportunity for families to come together and enjoy the great outdoors and the spirit of competition. Or at least what WE call competition. You see, everyone bats, everyone scores and every came ends in a tie. We also have space for dedicated volunteers, our “buddies” who help our players get the most out of the experience. Groups and individuals from all walks of life have volunteered to be buddies or our youngsters and we welcome you as well. Click on “Volunteer” to learn more! We also have been blessed with great supporters and financial donations to keep the field running. One of the best parts about Kiwanis Miracle League is the concession stand and every player enjoys a free drink after the game. Our players LOVE that! But most of all, Kiwanis Miracle League is something you must experience for yourself. Come out to a game this season! The Kiwanis Miracle League needs volunteers right away. Be a buddy, or volunteer in a variety of ways!